PRINCE WILLIAM COUNTY, Va.– Dulles Glass and Mirror, Inc., will be bringing $7.5 million in capital investment and 136 jobs to Prince William County, Virginia, over the next five years, the company announced recently. Dulles Glass and Mirror plans to expand its corporate headquarters, research and development, manufacturing, and warehousing operations, with a $7.5 million investment. The company also expects to generate 40 net new jobs, with an average wage of $51,092, over a five-year period. The company is retaining and transferring all 96 employees to the new company headquarters, which will be located at 7610 Doane Drive, Manassas, Prince William County, Virginia. "We're delighted to welcome Dulles Glass and Mirror into Prince William County and continue to deliver a top-ranked business climate where the company can expand and grow, providing more jobs for our citizens," said Corey A. Stewart, chairman, Prince William Board of County Supervisors, in a press release. "More and more companies are seeking out Prince William County as they outgrow their old facilities and require a highly-skilled workforce." Founded in 1972, Dulles Glass and Mirror, Inc. is a privately held company that manufactures glass, mirror, and shower doors for residential and commercial uses. "When you are known for the best quality and service, it is important that we consider both customers and employees alike. Our workforce is the core of our operation and allows us to achieve our goal," said Dr. Bahram Nasehi, vice president of operations/CFO, Dulles Glass and Mirror. Dulles Glass and Mirror (www.dullesglassandmirror.com) will receive the proceeds of an Economic Development Opportunity Fund (EDOF) grant in the amount of $100,000. The grant will help offset existing building renovations and new equipment purchase costs and assist the company in the location of its corporate headquarters, research and development, manufacturing, and warehousing operations. "It is always gratifying to see a Virginia-headquartered manufacturing company expand, further strengthening this critical sector," said Virginia Governor Terry McAuliffe. 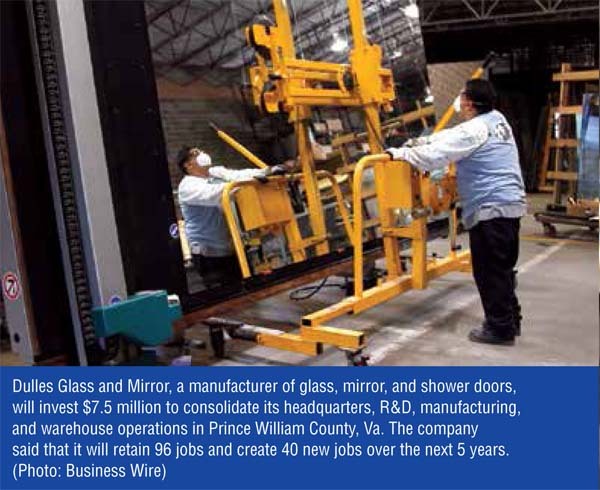 "Dulles Glass and Mirror has thrived in the Commonwealth for 45 years, and it was a priority to keep 96 jobs in Virginia as the company looked to consolidate and bolster its operations to meet increased product demand. Prince William County offers a facility that will accommodate the company's future growth, and a strong, skilled workforce that has contributed to Dulles Glass and Mirror's success over the past four decades. We are proud of our programs that train workers for the 21st century as we diversify and build a new Virginia economy."